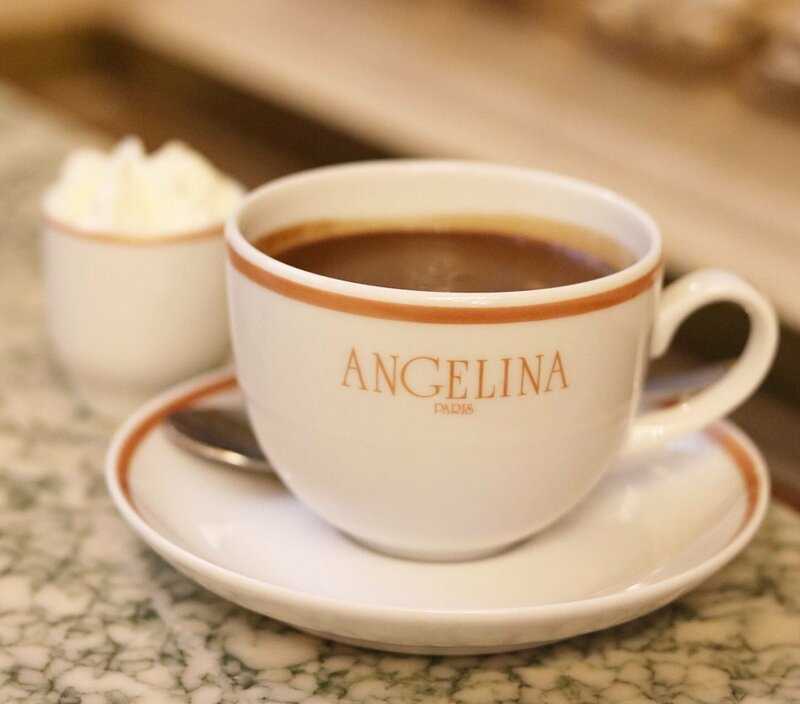 It is rumoured that Coco Chanel used to frequent Angelina, a Salon de Thé on rue de Rivoli, daily for a fix of their signature chocolat chaud (or hot chocolate to you and I), and having had a cup of it myself I can totally get why. Also she is my idol. This Parisian tea house stole my heart a few months ago when I visited the Dubai branch. The Paris branch however, affirmed my love for that thick, creamy, satisfying hot chocolate. The best I have ever had and nothing beats the original. Its first name was Rumpelmeyer, named after the owner Antoine Rumpelmeyer. However, in 1930, he re-named it in honour of his daughter-in-law, Angelina. How cute is that? On a recent trip to Paris, we were lucky enough to be hosted at a hotel literally round the corner from Angelina and so it was our plan to wake up early and have a Parisian style breakfast at this gorgeous venue before embarking on a day of sightseeing (and more eating). We arrived just before 9am and it was relatively quiet and really easy to get a table. I recommend visiting at this time! There were no tourists (apart from us) and just locals popping in for croissants and coffee or *THAT* hot chocolate. The decor inside Angelina has remained unchanged since the Dutch-born architect Edouard-Jean Niermans’s project, where he was commissioned to decorate the interior of the tea house. With mirrors adorning the walls, beautiful tapestries and marble tables, it is just so pretty and everything I hoped it would look like. When you enter, it has a slight contrast in design with white, modern furniture showcasing the finest pastries, sauces and items to purchase, as well as adorable pom poms hanging from the ceiling. We sat at a corner table and waited eagerly for our pastries, breads and hot chocolate to arrive. The condiments included jam and chestnut cream, which is heavenly, and I am kicking myself for not bringing a jar back with me. It was so relaxing having our breakfast there and we had it really leisurely and felt no pressure by the staff to leave. It was the perfect spot to people watch from and the croissant was the perfect Parisian way to start the day. So what makes the hot chocolate so special? It is known as an “African” Hot Chocolate and a blend of three kinds of African cocoa from Niger, Ghana and Côte d’Ivoire. It is so good and so rich but totally worth it and to this day I cannot find any hot chocolate that satisfied me as much as that one did. Our breakfast was a little pricey but was absolutely wonderful and definitely recommend in favour of a hotel breakfast, which if not pricier, lacks the certain charm dining in a tea house seeped in history of an era gone by has. Angelina can be found at rue de Rivoli next to Le Meurice. A trip to Paris isn’t the sane without a trip to Angelina’s. My favourite is the Mont Bland chestnut cream with a cup of the African hot chocolate. Awww isn’t it just the best!! !